Recent events in Charlottesville are a sobering reminder that violent white supremacist groups are not the stuff of history, but a horrifying present-day reality for a country that continues to be torn apart by racism and the legacy of slavery. Though these groups do not claim the membership rolls that the KKK did in its heyday, they have risen to new prominence over the past year, supported by infrastructure like Breitbart News and effectively urged on by a billionaire who owes his presidency to the race lie. The recent comments of another billionaire, hedge fund manager Dan Loeb, are especially repulsive in the current context. 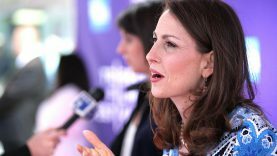 The racist nature of the comment – making reference to, and downplaying, the terrors of the KKK while taking direct aim at an African-American female elected official – has caused an uproar. 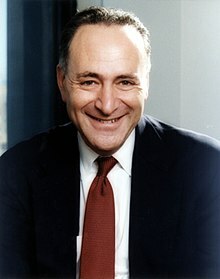 Dan Loeb has poured millions of dollars into the coffers of politicians like New York State Governor Andrew Cuomo, into the campaigns and PACS of the State Senate Republicans and “Independent Democrats,” into education privatization groups like Success Academy, and into PACs and Super PACs at the state and federal levels.  Loeb has sought to profit from outsourcing and mass job, pay & pension cuts; from driving up prescription drug prices; from forced austerity in Puerto Rico; from dirty energy and fossil fuels; and from Republican rule in Washington, D.C — we’ve got full details on all these points in the Hedge Papers series at hedgeclippers.org. For years, elected officials like Cuomo have taken Loeb’s money and carried water for his radical political agenda: a privatized education system, deep cuts to the social safety net, tax loopholes for corporations and billionaires, and a “democracy” by and for the mega-rich. 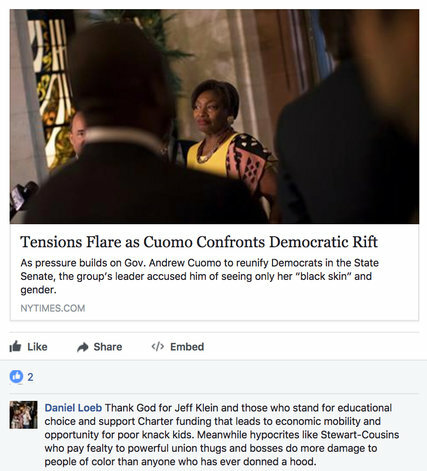 Loeb has bankrolled the toxic coalition of Republicans and “independent” Democrats that has blocked Senator Stewart-Cousins from becoming the first African-American woman legislative leader in the New York State Legislature. The Loeb-funded GOP-IDC coalition also consistently blocks, delays or waters-down policies that would help communities of color and working people in New York. 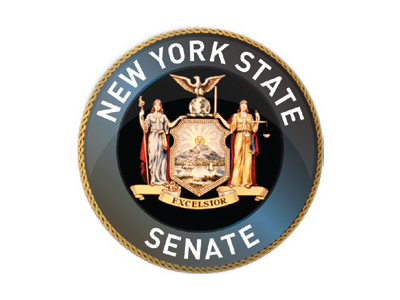 Fair, progressive taxes; constitutionally-mandated funding for low-wealth public school districts; affordable housing and tenant protections; criminal justice reforms; minimum wage increases; strong climate and environmental protections; long-needed mass transit investments — all have been stopped or slowed by State Senate Republicans working with the IDC and Cuomo. 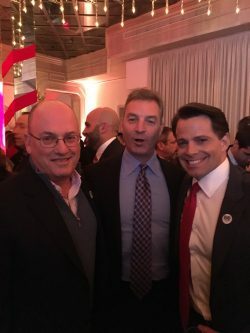 Politicians who support racist comments, racist policies or hard-right-wing solutions to social problems could comfortably take money from Dan Loeb — others shouldn’t. And now that Loeb’s attitude and impact are crystal-clear, politicians who have previously taken his money should give it back. 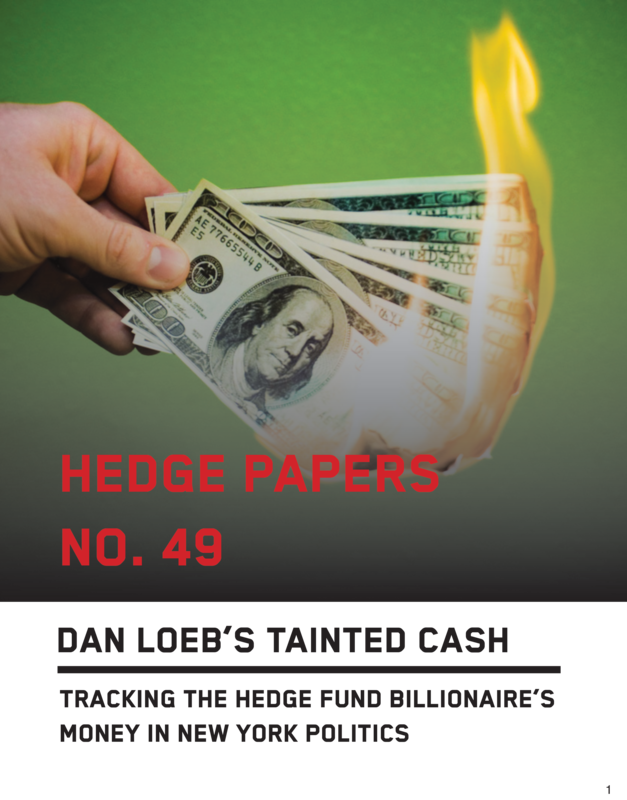 Hedge Clippers provides this scorecard to help the public understand the scope of Dan Loeb’s tainted multi-million-dollar campaign cash contributions to politicians in New York — and to support a new campaign calling on candidates to return and reject Loeb’s tainted cash. 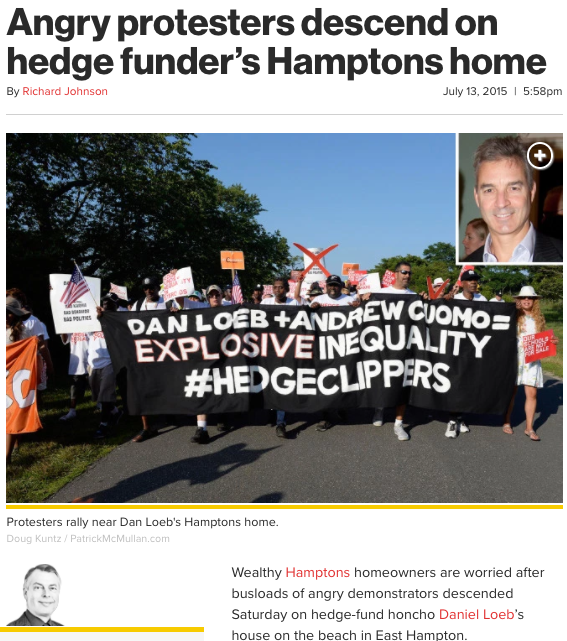 Controversial hedge fund billionaire Dan Loeb is a significant donor to Families for Excellent Schools, which has provided political cover and policy ideas to Governor Andrew Cuomo. Loeb’s charity, the Margaret and Daniel Loeb Third Point Foundation, donated $2,000,000.00 to Families for Excellent Schools in 2015. 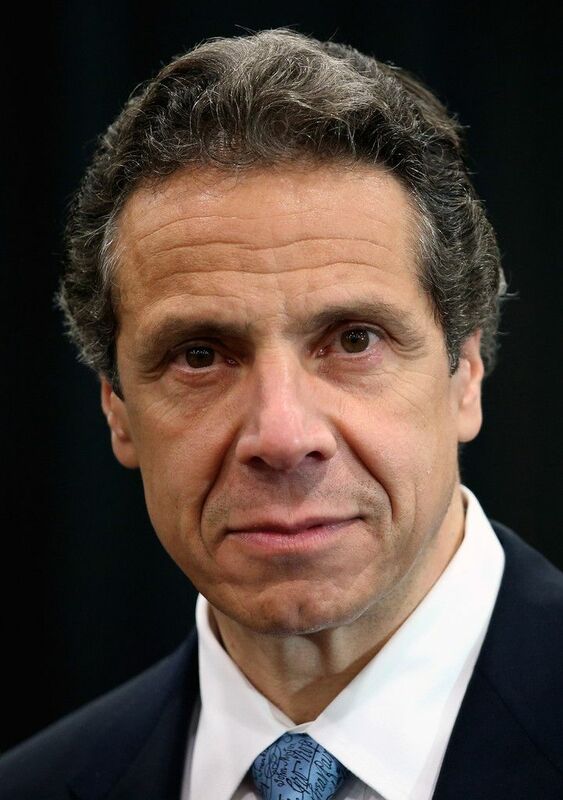 Cuomo dropped applause lines at the March 2014 rally in Albany. Dan Loeb has also paid event costs for two big Cuomo fundraisers. 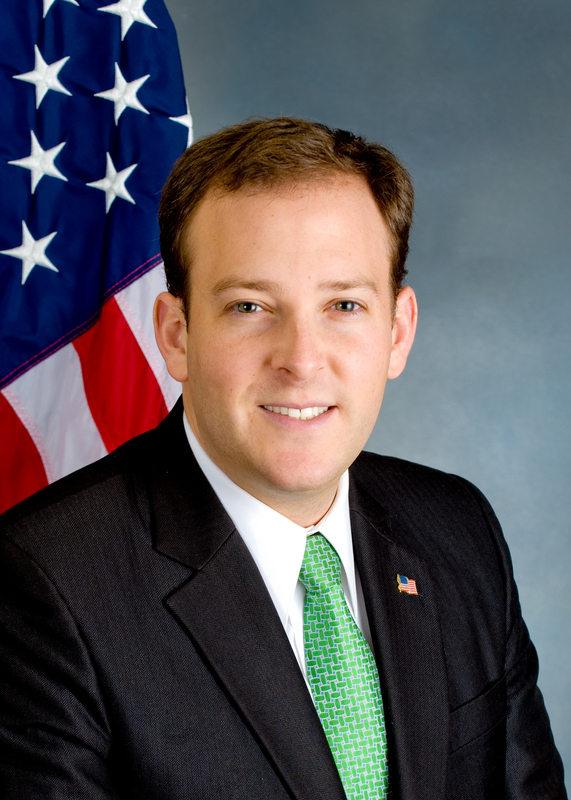 Others who paid event costs during the same period include Gristedes’ owner and Democrat-turned-Republican John Catsimatidis, Stone Management’s Richard Ostroff, Centerview Partners co-founder Blair Effron, Entrust’s Gregg Hymowitz (Entrust is an investor in Third Point), and Pioneer’s Michael J. Falcone. It is unclear whether the event costs were split between these individuals. 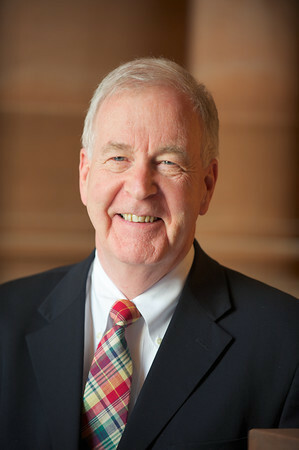 The fundraiser drew activist protests. 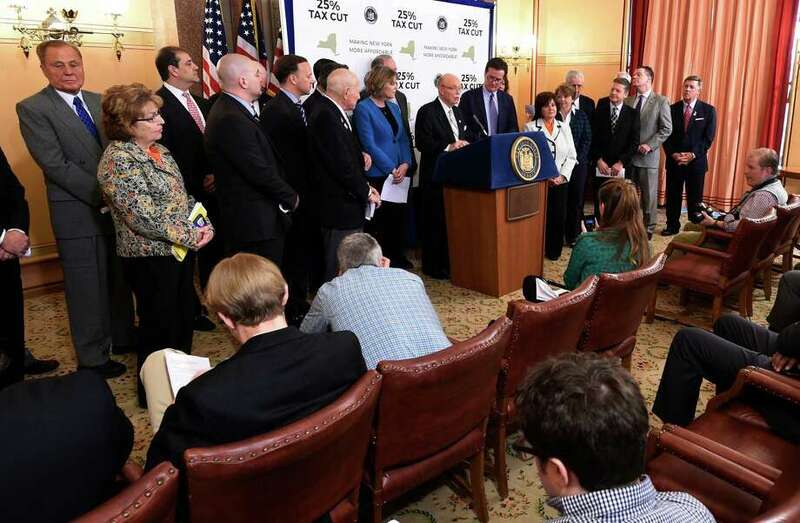 Loeb does not appear to be listed as an in-kind contributor to Cuomo for this event. 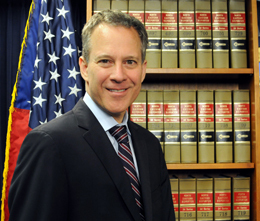 Donors who contributions to Cuomo’s campaign were reported within days of the event included Bruce Ratner, Daniel Nir, Larry Robbins, Steven Roth, John Gutfreund, Lizanne Rosenstein (wife of JANA Partners’ Barry Rosenstein).